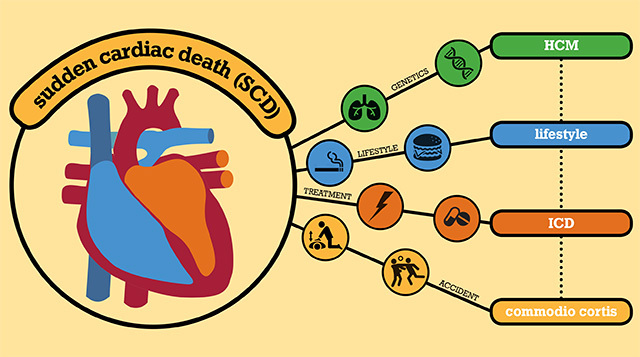 Sudden cardiac death (SCD) is an extremely rare event. The most common reason for cardiac death related to sports is the cardiomyopathy hypertrophic, an abnormal enlargement of cardiac muscle. It’s a rare heart disease that predispose a person of SCD because of physical exertion. Commotio cordis is another reason for SCD. It’s a direct trauma to the chest at a specific moment in the cardiac cycle and this trauma triggers a dangerous arrtyhmia (abnormal rhythm) of electrical system of the heart. A commotio cordis usually arrives in sports where a blunt projectile, such as baseball ball or hockey puck, hits the athlete’s chest. Cardiac arrhythmias that threaten the lives of young athletes are very difficult to treat. The immediate use of AED (automated external defibrillator) can provide an advantage. Unfortunately, the only way to prevent death from hypertrophic cardiomyopathy is to identify the disease and recommend the athlete avoid any strenuous activities. Cardiac ultrasound can diagnose this condition. Some experts have called for the screening of athletes with ultrasound or electrocardiograms (EKG), although this screening is controversial because of the high cost and scarcity of this condition. However, athletes with cardiac symptoms such as dizziness, fatigue, shortness of breath in relation to physical activity, palpitations, convulsions and especially syncope (fainting) must stop the competitions and must do deeper tests. In addition, a family history of cardiac abnormalities justifies a complete cardiac evaluation. Especially a known parent with hypertrophic cardiomyopathy or a history unexplained sudden death in a family member. There is the creation of different forms of protection for the chest and pads, but unfortunately no method has prevented this tragic event. The rules regularly change in the sport and some times to try to avoid commotio cordis. For example in baseball and softball, it’s the limitation of the use of aluminium bat. This rule can protect the pitcher by decreasing the speed of the ball after contact with the bat. There are other rules too, such as using a softer ball and teaching players to turn their chest when the ball is hit by the bat. Fortunately, SCD is extremely rare in the sport. For the majority of people do sports to cardiac benefits. In young athetes, the most common causes of SCD are 25-30% hypertrophic cardiomyopathy and 20% commotio cordis. Coronary artery abnormalities are the cause of 14% of SCD in athletes. Marc-Vivian Foe, a Cameroonian soccer star had a sudden cardiac death during a match in 2003.